We have added 2 new sires in recent months. Southern Cross Dorpers 160019 'Martin' (Type 4) - a son of Kaya 130153, sold at the National Dorper Sale 2015 for $20,000. 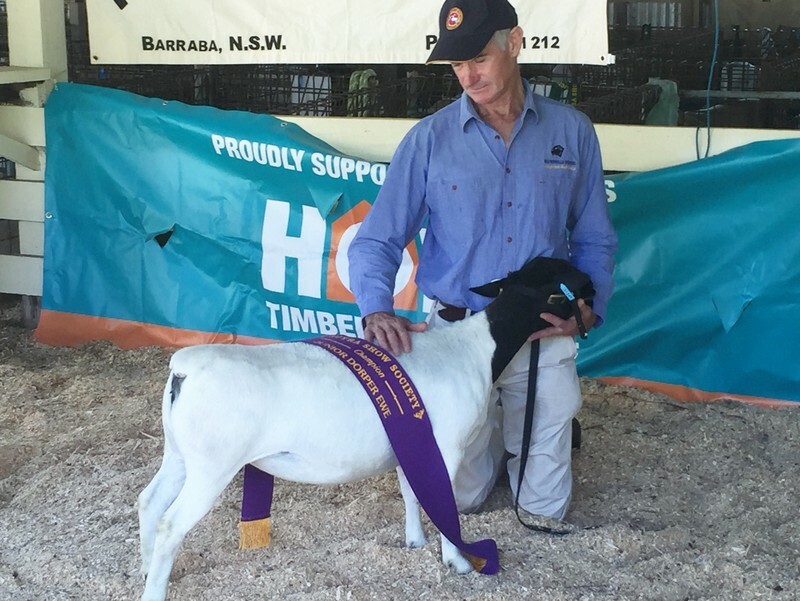 ​Thanks to the generosity of Mark Gett of Whynot Dorpers, we are also using Lynkm Springs 130003 (Type 5) - Phillip Strauss and Kaya bloodlines. Guyra Show 2016 - Congratulations to the organisers of the Dorper section of the Guyra show held on 19th February 2016, Hilton Noon and Sharon Bowles. A really well organised and fantastic day, professional as well as friendly! Around 9 exhibitors, fantastic sheep and expert feedback from judge Phillip Van Schalkwyk. Congratulations to all exhibitors, in particular Tuckeroo Stud, for taking out most successful Dorper exhibitor and Nomuula Stud for most successful White Dorper exhibitor. 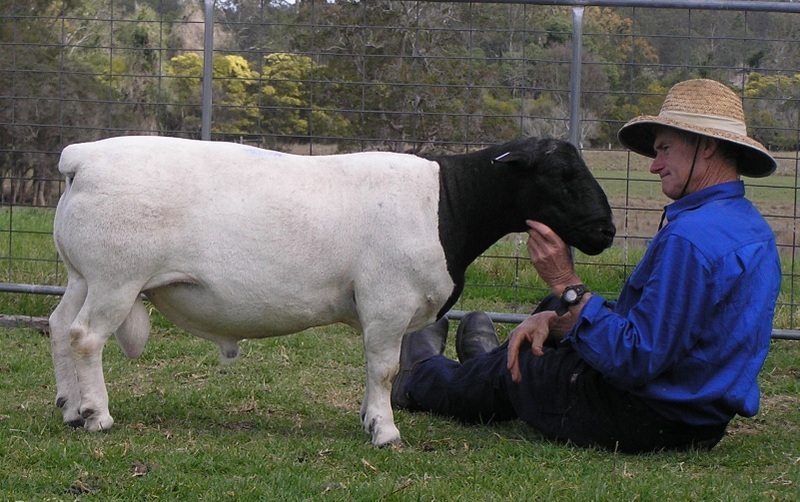 ​Old Munbilla was fortunate to take out Junior Champion Ewe and Junior Champion Ram. May 2015 -It was great to catch up with the enthusiastic breeders at the Dubbo Show last week. Congratulations to Global and Netanya for taking out the most successful exhibiter in the Dorper and White Dorper sections respectively. This year was mainly an opportunity for us to catch up with other breeders and we did take along 2 ewe lambs to be involved and to see how they stacked up against the other great sheep on display. We narrowly missed a ribbon but were far from disgraced with our 2 ewes being little more than 3 months old in the 3 - 6 month class. These ewes were both from Old Munbilla sire 'Dalby' which we were very happy about. We are looking forward to our main lambing in the next month or six weeks and will looking forward to seeing our first progeny from Netanya 'Winston'. December 2014 -Philip van Schalkwyk came to Old Munbilla to grade our 2012 1nd 2013 drop sheep. It is always a challenge to get inspectors to the area and we really appreciate Philip's effort in coming to the North Coast and for being very generous with his time in providing feedback on all our flock. We were very pleased with the gradings and the general feedback he provided. Philips advice has helped to refine the qualities of the next sire we bring into the stud. Philip also graded for 'Tuckeroo', 'Carilla' and 'Camira Downs' during the trip which worked well for all concerned. We were also thrilled that the 2012 drop ewes we sold to 'Tuckeroo' Stud made a good impression with 8 making Type 5 and 11 Type 4. It is always pleasing when sheep deliver on the hopes and expectations of buyers. I hope the progeny they provide for Scott and Amanda will be similarly pleasing! 2014 - The National Dorper Show and Sale at Dubbo was a major milestone for the breed in Australia. Experienced, qualified breed inspectors assessed all entries prior to sale providing buyers confidence that all animals presented are true to the breed standard and free from structural faults. The grading confered by the panel on the day provides a genuine assessment of the merit of each animal and this can only add to the standing of the National Sale as the genuine elite dorper sale. 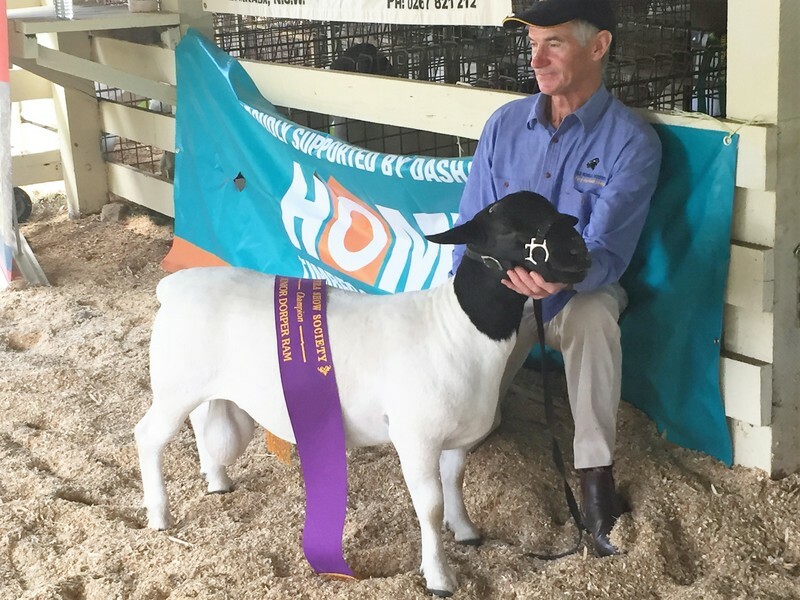 Refinement of this valuable initiative in coming years will further enhance the National Show and Sale as the pre-eminent venue for sellers and buyers of quality dorper sheep in Australia. Congratulations to the organisers of the event and the inspectors who carried out the tough job of assessing the animals prior to sale. Objective measurement -The sale also saw the opportunity for animals to be scanned to provide vital objective data to benefit buyers. This scanning provided very positive feedback for Old Munbilla. The only ram we took to the sale produced exceptional eye muscle depth. At only 77Kgs 130939 scanned 48 EMD and 4 mm fat. Only 3 rams scanned equal to or greater than 48 mm EMD and these were much bigger, all over 90Kgs and fatter at 5mm fat. These were three rams from Batten Farms WA. A new Sire - Netanya 'Razor' The rigorous assessment of lots at the sale provided added confidence for our purchase of 'Razor' from Ron and Sandy Pagett's Netanya stud. Razor is from imported 'Dorsland' genetics, well known through the achievements of sires from Global Dorpers. Razor has been successful in the show arena - Reserve Junior Champion in 2013 and Reserve Senior Champion at the 2014 State Championships. Razor's progeny have already excelled with Netanya 'Ollie' being judged Junior Champion at the 2014 State Championships. The photo below shows Razor readily settling into his new home. It is clear he should do nothing to undermine the temparament that Munbilla dorpers are known for!